"This easy vegetarian side dish can be used as a dip, too. You can use mayonnaise instead of yogurt." 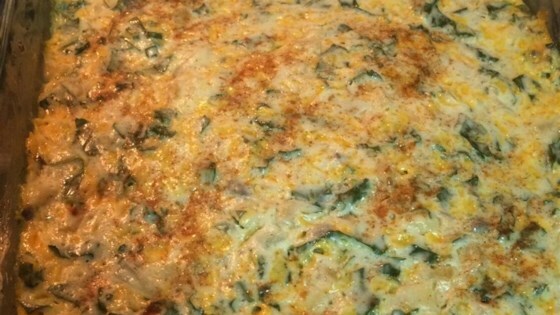 Whisk cream of mushroom soup, yogurt, and egg together in a 9-inch square baking pan; stir in Monterey Jack cheese, kale, apples, and onion until evenly combined. Season with salt, pepper, and paprika. Cover pan with aluminum foil. Bake in the preheated oven until casserole is warmed and bubbling, about 45 minutes. See how to make this popular low-calorie crispy snack. Super easy. I had vegetarian guests and served this as a side. All the guests not just the vegetarians raved about it.